What makes WSI different from other digital marketers? The people and the approach. When you become a client of WSI and work with a local WSI digital marketing consultant, you gain the power of the WSI Lifecycle, a six-stage, results-oriented strategy that has worked for thousands of WSI clients around the globe. From small and mid-sized businesses to large corporations across a range of industries, and whether you need an enhancement of your existing marketing campaign or a complete overhaul, WSI uses the philosophy of the Lifecycle to create a custom-tailored plan to grow with your company. Discovering your company’s “e-profile” helps WSI understand the current state of your business and your Internet marketing. What’s working and what’s not with your current campaign? What is your vision for the future? How is your current website performing, and who is it reaching? All these questions and more will be asked in this exploratory phase. 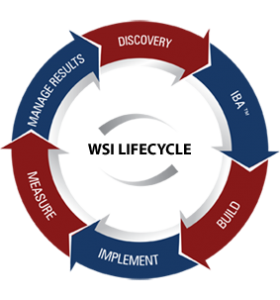 The IBA is a “big picture” view of how our marketing solutions can specifically help your organization. Our WSI digital marketing consultant and team of experts will determine what suite of services you can benefit most from, and how best to maximize your operating budget. Here, we also establish clear goals for the future growth of your company and what we expect from a WSI marketing campaign. In the build phase, we take a close look at your existing web assets (if any), and then develop a custom plan to establish your web presence. The best websites are clean, elegant, and clutter-free. And today’s modern website is not just a receptacle of information; it’s a living, breathing, interactive portal to your company. Here’s where our plans are put into action and the campaign goes “live.” Our WSI digital marketing consultant will be with you every step of the way. But don’t think our job ends there. Testing is a crucial component of implementation, and we thoroughly test each phase of your campaign before release. Using advanced web analytics tools, we monitor the campaign and track which components are driving the best results. In this stage of the Lifecycle, our goal is to track and measure the digital marketing strategy to ensure it is helping you achieve your goals. We’ll analyze the campaign’s results with respect to the benchmarks we established earlier in the process. Are we measuring up? What areas can we build on, and what areas could use a different approach? Remember, WSI is all about results. We’re excited by the opportunity to work with you to take your company to the next level. Contact us for more information about the our Lifecycle process and work with a local WSI digital marketing consultant today!